Encouraging people to sign up to your email list is one of the main challenges you face as a marketer. A targeted list is one of your most important marketing tools, an asset that you have complete control over and one that you can use to reach out to contacts whenever you want. Marketers use a variety of tactics to get more sign-ups, including lead magnets like ebooks and white papers, as well as content upgrades, webinars, and more. But one of the best options is to create an email course. Here’s why these are such a great idea, as well as how to go about setting one up yourself. There are a number of reasons why email courses work so well. Firstly, you’re providing valuable content. One of the secrets of successful email marketing is to provide consistent value. In fact, that’s the bedrock of good email marketing. So by teaching your sign-ups something new, you are instantly providing value—and that’s a tempting proposition for would-be sign-ups. They will enjoy learning new information if it is valuable to them, and it provides instant gratification, especially if your course solves a specific problem for them. But the benefits of email courses go beyond this. With each email you send that gets opened, you are also doing something important: You are getting your new sign-ups into the habit of opening your emails. If they know they will find useful information inside, this makes them more likely to look out for your emails. And that’s a habit that will continue—as long as you keep on providing value. Subscribers will also hopefully be grateful for receiving high-quality information for free, so when you later ask them to do something for you, like comment on your blog or share your latest post, they are more likely to do it. And finally, it positions you as an authority. Not everyone can teach on a topic, and by teaching a useful skill or knowledge, the implication is that you know your stuff. Obviously, you DO know your stuff, but teaching it in a course is a clear way to get this across to those people who don’t know that yet. The real beauty of an email course is that it is so easy to set up. All you have to do is come up with a skill or set of skills that you would like to teach and then create a series of emails around it. Your course should have a clear goal (e.g. “Learn How to Launch Your First WordPress Site”). Once you have decided on your goal, create as much information as you can around the topic. Don’t worry about sorting it into emails yet—just get the information down. Once you have all the information you need to provide your subscribers with, divide it up into separate email lessons. Because these are emails, you want to keep them fairly short, especially seeing as many people will view them on their phones. But then again, if you are providing genuinely useful information, don’t worry too much about the length. How Many Lessons Should You Create? How many lessons, or emails, you create will depend on what you are trying to teach. There is no limit on the number of email lessons you can provide. It could be anything from three to 20 or more. However, I would recommend keeping it to between five and 10. The reason you might not want too many emails is that you don’t want to spread it too thin. As soon as your subscribers start to feel that they are not getting genuine value from your emails, they’ll stop reading them. So to err on the side of caution, pack in lots of useful information into a few emails rather than create a large number of emails that are thinner on useful content. 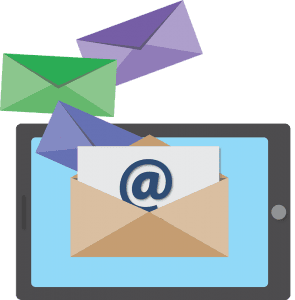 While the basic process may be simple enough, there are lots of things that you can do to make sure your email course generates genuine leads. One of these is to encourage replies. Set up your course so that people can reply to the email they receive and it will go straight to your inbox. This is a great way to get your leads more engaged with you and your brand. You could ask them to just say hi or to send over any questions they have. Even better, provide some bonus information in response to a reply. Ask them a question at the end of one of the emails and explain that those who reply will get a bonus lesson, even if they get the answer wrong. This is an easy way for them to get some bonus info, and it also gets them to introduce themselves. Another important tip is to use your very best stuff and don’t be tempted to make your course too ‘light’ on info. If you are selling a course and this is just the freebie, make sure you still provide genuine value in your free course. Otherwise, sign-ups will assume that the full course is the same low standard. The trick is to provide genuine value but then to offer something even more for the full version. Whatever you are selling, don’t be tempted to whip up a few basic emails and call it a course just to get people to sign up because that could hurt your conversions. Another thing to be wary of is going for the hard sell in your email course. Sure, link to the odd blog post and even a product, as long as it is relevant to the info. Just don’t make it look like the whole aim of the course was to sell something. The most important thing right now is to get them on your list, and you want them to trust you and know that you are an authority in your niche. You might want to sell your product at the end of the course. But if you are going to be sending out regular emails, you could wait until after the course has finished. In any case, only start selling after you have provided a few good emails packed full of valuable info. Finally, consider creating a few different courses for different types of customers (if this is relevant to your business). The courses take some time to create but remember: You can use them over and over again for as long as the information remains relevant. Having three or four courses could encourage more sign-ups, and you could also offer the other courses to people who have already signed up to one, which is an effective way to segment your list. And do anything else you can to get the word out. When you update it, make sure people know, and when you create a new course, tell everyone. Create a landing page and use CRO techniques to boost conversions. Set up some AdWords ads and test them. In short, put some work into promoting it. Soon you’ll have a highly targeted email list of subscribers grateful to you for sending them such value-packed content.